Astonish Paris with an Apple! Paul Cézanne said, he wants to astonish Paris with an apple – and after 30 years of hard work and dedication, he did. Show the kids how they can do the same. Give them an apple, piece of paper, oil pastels and little bit of oil in a cup. 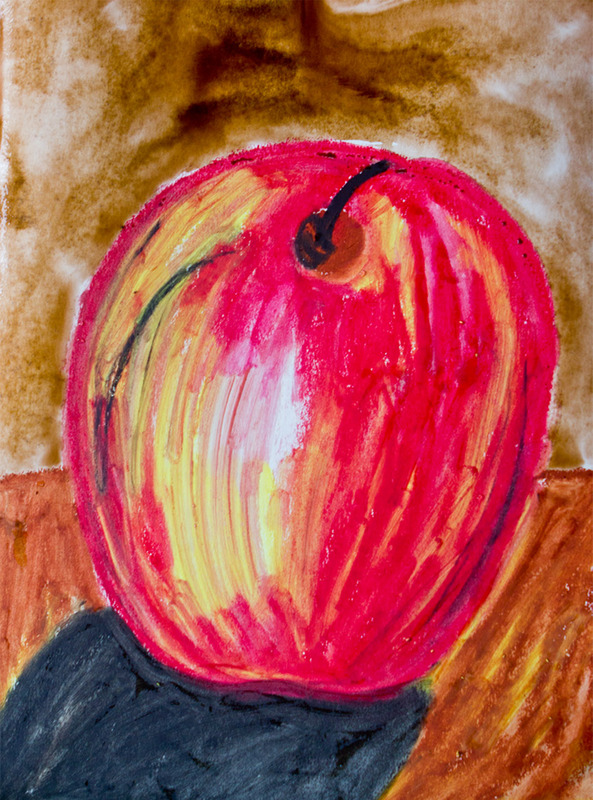 First, the kids sketch the basic shape of the apple and then color it in with the oil pasels. It does not have to be perfect but it is nice if they can press down hard (to get nice, bold colors) and hold their pastels down low (so that they do not break). When they are done, ask them to dip a q-tip in the oil and use it to blend the oil pastels together. They will be amazed how smoothly iy works and how much fun it is. Just make sure, they do not spill the oil. I put a paper plate underneath and keep a lot of paper towels handy, just in case. If you want to achieve the same effect we did – use watercolors in the end to paint over the background. The good thing is, if you do paint over the apple, it doesn’t really matter since the paint does not stick to the oil at all. Just wipe it off with a paper towel and you are done. I am doing this project in a couple of days with first-graders – but we will do more than apples. We’ll talk about composition and add pumpkins and squashes to the mix. Stay tuned for the pictures!